My mom makes the most amazing Swedish meatballs and the last time I enjoyed them I realized they would be a snap to prepare in an Instant Pot. It’s great to sear meat in the IP because its high sides keep the area around the pot from getting spattered. The pressure cooker function also means the meatballs are done in a hurry. I love to prepare big batches of meatballs and freeze them raw so I can just pull them out as needed and cook them up in a variety of different ways. If you’re a meatball fan like I am, you might enjoy my pizza meatball casserole, these Russian-inspired meatballs in cream sauce or these scrumptious smoked cheddar meatballs in cheesy beer sauce. For this recipe, if you don’t have an Instant Pot, you can simply bake the meatballs for 25 minutes at 350F on the parchment lined baking sheet. Make the sauce in a saucepan using 2 cups (500mL) of beef broth (not the 2 1/2 called for below) and when the meatballs are finished baking, add them to the sauce and simmer for a few minutes before serving. In a large bowl, combine ground beef, panko, shallot, 1 tablespoon (15 mL) of the chopped parsley, Dijon, Worcestershire sauce, allspice, cayenne, garlic powder, pepper, salt and egg. Mix until combined. Using your hands or a small cookie scoop, shape into 30 small meatballs. Compress them just enough to hold together but avoid packing them too tightly as this will make them a bit tough in texture. Place the prepared meatballs on the parchment-lined baking sheet as you shape them. Preheat the Instant Pot for a few moments using the Sauté function. Add 1 tablespoon (15 mL) of the olive oil and let it heat up, then add half the meatballs around the perimeter of the pot. Cook, turning a few times, until browned. Remove from pot with a slotted spoon and set onto a second baking sheet. Repeat with remaining oil and meatballs. When all meatballs have been browned, return them to pot and add 1 1/2 cups (375 mL) of the beef broth. Cover the pot and close the valve on the lid then press the Pressure Cook/Manual button or dial (High pressure), and then the + or – button or dial to select 4 minutes. When the cook time is finished, let the pot sit undisturbed for 6 minutes (6 minute natural release). To speed things up, I like to make the sauce in a separate pot, but you can also remove the meatballs from the Instant Pot once they are cooked and make this in the pot with the Sauté function if you prefer, then return the meatballs to the pot. To make sauce, in a medium size pot, melt 1/4 cup butter over medium heat then add 1/4 cup flour. Whisk continuously for 3 minutes until flour is cooked. Slowly stir in remaining 1 cup (250 mL) beef broth and whisk until thickened. Add heavy cream, Dijon and Worcestershire sauce. Bring to a simmer then add salt and pepper to taste. When the meatballs have cooked and the pot has depressurized, open the lid and add the sauce to the pot. Press Sauté function and cook for 2 – 3 minutes, stirring gently. 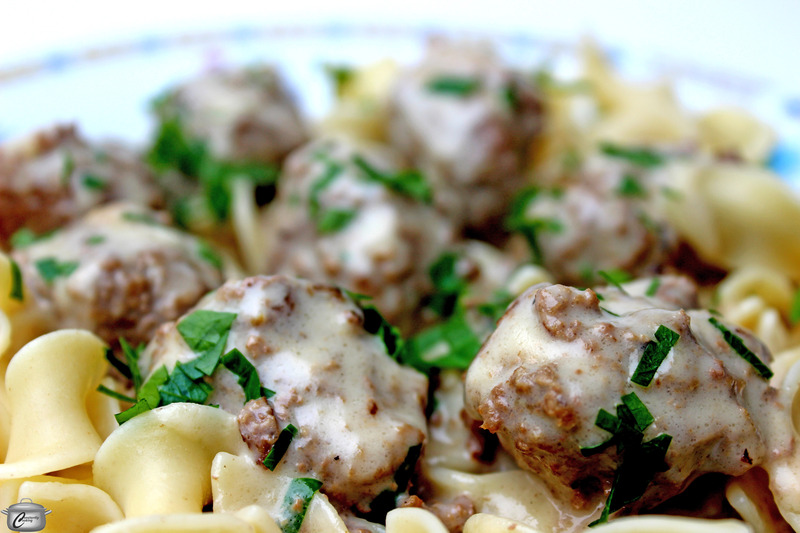 Serve meatballs over hot mashed potatoes or egg noodles, garnished with remaining chopped parsley. 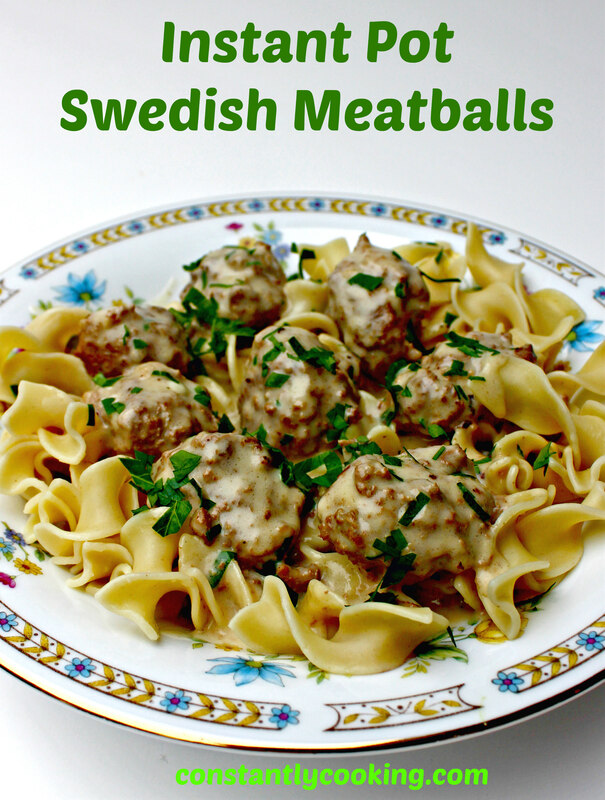 This entry was posted in dinner and tagged ground beef, how to make meatballs in an Instant Pot, IKEA, Instant Pot, meat, meatball, meatballs with creamy sauce, Paula Roy, Swedish meatballs. Bookmark the permalink.